A lot has been published about most expensive keywords over time but there is a problem with those CPCs, these are average rates. Let me explain, “free online auto insurance quote” keyword will cost you approximately $75.01/click if you are targeting United States. While the same keywords when clicked from Alabama will cost you whopping $344.06/click. CPCs varies from state to state, also those studies published by different reputable brands cover the most expensive keywords from different industries and put them together at one place like this infographic by WebPageFX or this one by AdGooroo. These are very helpful to get a good insight about the current trends in PPC marketing and help us to explore further based on those stats. However, those CPCs are not very accurate if we want to use them as a benchmark especially by WebPageFX and there is a reason. In their Infographic they published “San Antonio Car Wreck Attorney” as most expensive keyword with $670.40 CPC and they get the keywords data from SEMrush. I searched for the same keyword in Google Keyword Planner and found that it has CPC of $71.78 in United States. There is a huge difference. I am sure the data provided by SEMrush is accurate but there must be a physical location attached to this keyword which wasn’t taken into consideration. The $600+ CPC must be from a specific state or a city just like I mentioned about “free online auto insurance quote” keyword above which has significant difference in CPC from country to state. 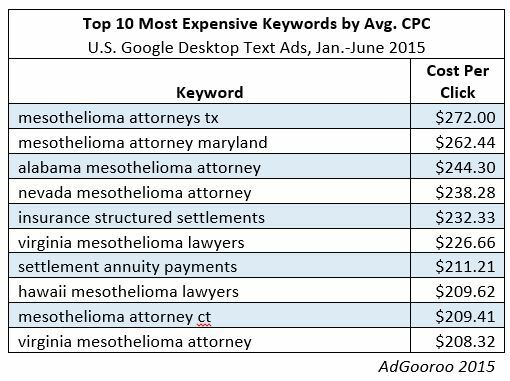 On the other hand, study published by AdGooroo showing “mesothelioma attorneys tx” as most expensive keyword. And when I searched for this keyword in Keyword Planner, CPC is close to what was suggested by AdGooroo. So this study is more accurate in my point of view which actually shows the most expensive keywords regardless of their locations within the United States which mean every click on these keywords will cost advertisers with approximately same amount, give or take few bucks. While on the other hand, most expensive keyword in WebPageFX infographic may cost you $640+ per click if clicked from specific location otherwise its way below. Moreover, when I searched for mesothelioma keywords, I found out that these keywords perhaps the most expensive I have ever seen in my life which further support the data provided by AdGooroo, mesothelioma attorneys are most expensive niche online not car wreck attorneys. I am not even sure if this is most expensive keyword or not but I haven’t seen any amount near to this one yet. This was the reason I tried to find the location specific CPC for keywords. For a starter, I picked up Insurance industry to look one by one in each state and it opened a whole new world to me. Insurance industry in United States worth $1.1 trillion in 2014 and considered as a one of the biggest industries online with very high cost per click rates. If we further narrow down this industry, we find that Life/Health is at 56% and Property/Causality insurers are 44% with recorded premiums. There are more than 6100 insurance companies in US. So the revenue involved in this industry and large number of companies competing against each other online and offline gives us a good idea why insurance keywords are so expensive. 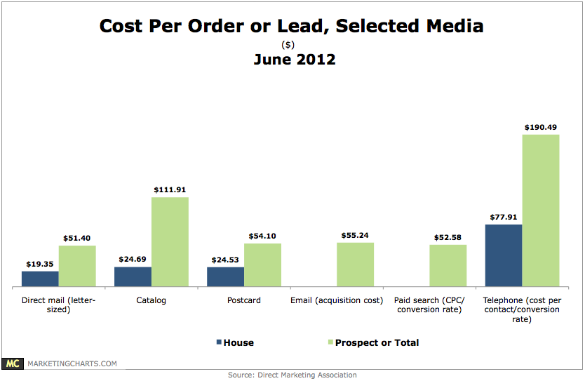 According to marketing charts the cost per lead stood at $53.58 for paid search which is again a signal to invest heavy in cost/click especially in the industries where ROI is extremely high. Financial/Insurance companies spent 10% of their total revenue on digital marketing. I have spent months researching on insurance keywords, went through hundreds of thousands of keywords during time. I can tell you one thing; keyword research is not what is commonly practiced all around the world in which you use a word like “insurance”, “cars for sale” etc. in Google keyword planner or other keywords research tools and get solid results. You have to dig deeper even more deeper to find what you are looking for either they are long tail or most expensive keywords in this case. Keyword research tools don’t provide you most expensive keywords in one shot. You have to categorized your initial keywords file and split them into smaller categories and then start the whole process again with each of category and may have to create sub categories out of each and then repeat the process once again. When I first downloaded the initial insurance keywords file, I got approximately 800 keywords and I thought, that’ it, it’s just a matter of hours but I were dead wrong, keywords expanded to over 10,000 and it took my months to organize them and I am still not finished yet. Moreover, I figured out that each state have different stats and CPCs which increased my work load by 51 times and one more thing I noticed that people search those keywords with state name and even city name too. This was the time when I put hold to the research because it was never ending and I had to do other stuff too. That’s how I reached to the point where I decided to produce this map which visualize most expensive keywords in each state and give us another view of keywords, their CPCs, and search behaviors. 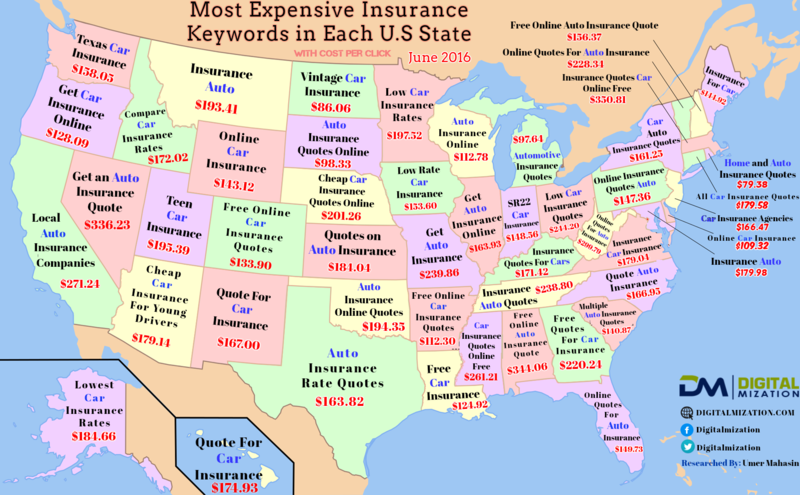 Here you go, this map will show you which keyword is most expensive in each state. I have researched for over 6 months on insurance keywords and analyzed thousands of keywords.